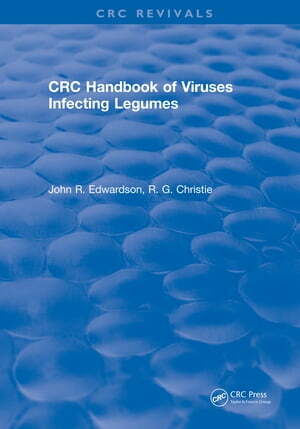 Collins Booksellers - CRC Handbook of Viruses Infecting Legumes by John R. Edwardson, 9781351088091. Buy this book online. This interesting handbook discusses 145 plant viruses in 27 groups and 31 unclassified viruses in naturally infected legumes. The viruses were observed in field infections of 281 species in 64 genera of the Leguminosae. The book presents information regarding resistance sources and resistance-breeding, vectors, seed transmission, and host ranges. Measurements of virus properties are organized in tabular form for particle dimensions, serological relationships, nucleic acid percentages, sedimentation coefficients of particles and nucleic acids, molecular weights of nucleic acids and coat proteins, optical density, and buoyant density. Handbook of Viruses Infecting Legumes is unique in that it relates inclusion cytology to plant virus detection, identification, and classification. Light and electron micrographs illustrate morphology, location, and staining reactions of inclusions. Of the 27 groups that contain viruses infecting legumes in nature, inclusions are diagnostic at the group level in 15 of these groups. Plant breeders, diagnosticians, plant virologists, and students of plant virology will find this an indispensable guide to legume viruses.